Being out-and-about affords the student the opportunity to see ‘public space’ advertising such as billboards, posters and bus/tube adverts. We don’t have much of that in rural Devon but there are many examples online. The brief asks for comment on how the text informs the image. Much of modern print advertising uses text to open up the meanings, in some cases almost to the point of incomprehensibility. The text is designed to evoke a concept, an idea of the effect the product will have on the purchaser. Since the establishment of the Advertising Standards Authority in 1962, advertising has been subject to more and more restrictions and standards. This was largely a matter between the Authority, agencies, broadcasters and publishers until ‘legal, decent, honest and truthful’ became the mantra, sometime in the early eighties. After that the public, when outraged, knew what to do and they did it with relish. The behaviour of advertisers was beginning to be shaped by public morality which was good in one way, because it reflected social appetites, but bad in another because those appetites just kept changing. The ad assumes a great deal of knowledge on the part of the potential buyer. That simple tick under the word has cost Nike millions to promulgate and protect; it is recognised worldwide. The text being used was part of a larger campaign which included various phrases, expanding on the values of equality in sport. In this case the text opens the effect of the device (the tick) to almost unlimited associations. This one closes it right down – there’s pretty much nowhere to go, it’s all in the frame. 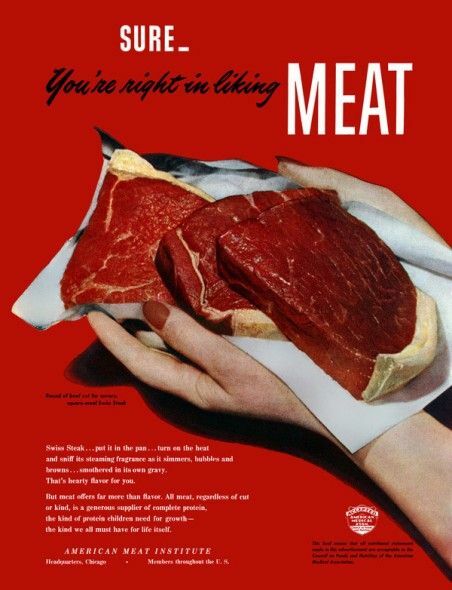 It painstakingly explains the advantages of meat consumption. The only slight departure from underlining the obvious it the reassurance that the consumer’s choice is rooted in some fundamental truth. This entry was posted in IP 4.2 Ads on June 19, 2018 by Concentrik1.